Hi friends – welcome back to another post featuring some FUN Hero Arts products! And what a great month this is – we are saying ‘thank you’ to ALL our amazing sponsors this year, it has been so much fun to create with their products! AND to pay it forward, we have 10 prizes this month – EEEEPPP!!! Please leave a comment on any/all posts AND for another chance to win, link up a holiday card – we love seeing your creations! I made a fun circular card using Hero Arts new infinity circle dies – people, have you seen these dies? There are 18 dies in this set – amazing and a great price! My base card and top layer are all white but heavily sponged with ink for a distress look. I stamped the image repeatedly with red ink then accented the floral images with a Copic marker; to tie it together, I colored the stripes on the designer paper with Copic colors too. I seriously struggle to color/stamp things in non-realistic colors – like those holly leaves, killed me not to make them green (#nerdalert) but I loved stamping them in Hot Fudge and still coloring the berries red; fun accent to the coffee cup, some glossy accents for the berries are the finishing touch. I stamped a sentiment on the inside and added more striped paper (smaller stripe). Next to impossible to see, but the holly image is stamped all over the top layer in 2nd generation Natural ink. Thanks for stopping by; hope tosee YOUR creation this month! I love shaped cards and this is darling. Love the continuation of the stripe patterned on the inside. Sweet! Such a beautiful card!! Love the coffee cup!! So pretty!! This is cute inside and out. 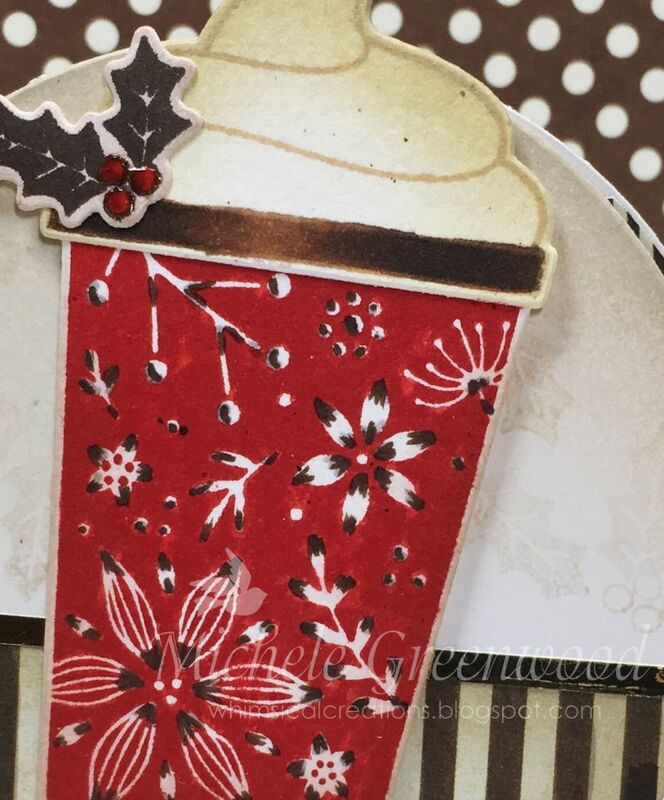 Oh, this card is so cute…love the Christmasy coffee cup and fun round design! Super fun card and I love the circle shape. Wonderful use of the circle dies. Like the shaped card. Love this fun shaped card! I featured it over on the Coffee Loving Papercrafters FB page! This is beautiful! Love the intricacy of the cuts on the cup! WOW – that drink sure looks yummy! Love all the beautiful details of your card. 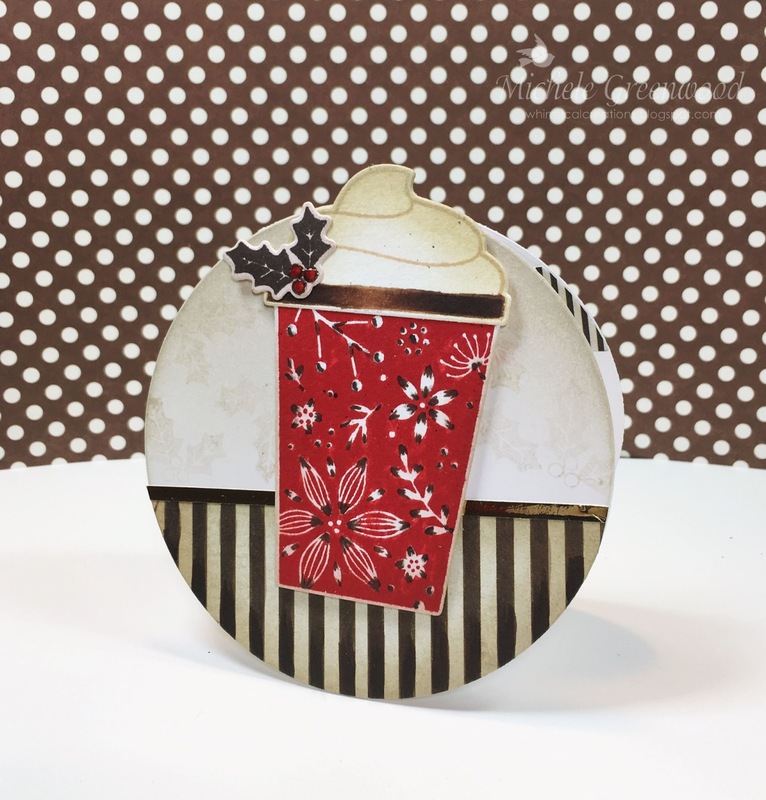 Love that awesome circle card with the very festive cup! Great details on this sweet card! It's making me crave a mocha! Love this circle card. Very festive and fun. Oh this is so wonderful! Always love a cute coffee card! Love the touches of black agains the red and white! Such a pretty coffee cup! Checking out the infinity circles for sure! This is darling. The cup looks great against the circle shape. Well done. Love the festive cup and the circle shape. 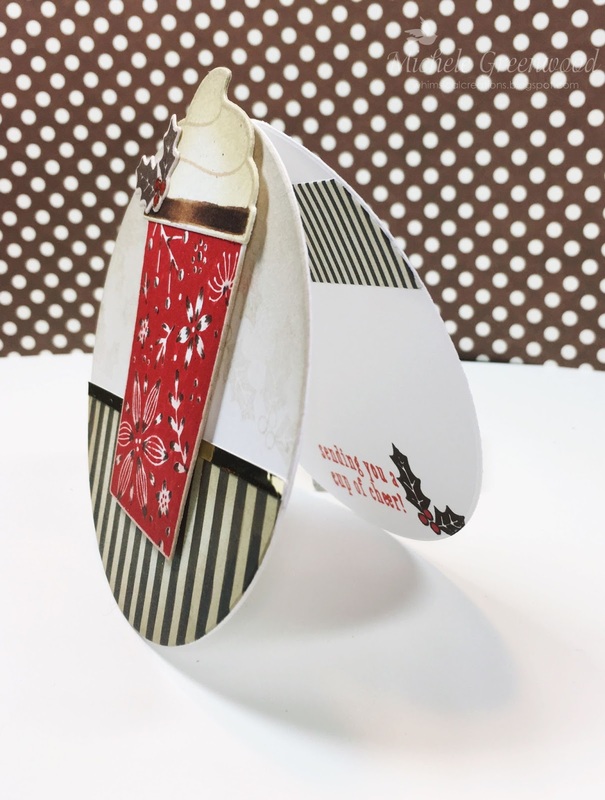 Shaped cards are awesome, and even better that this one has a coffee cup on top – love! I am loving this round card with the cheerful coffee cup design! I can't start the day without it. What a wonderful design! I want a sip! 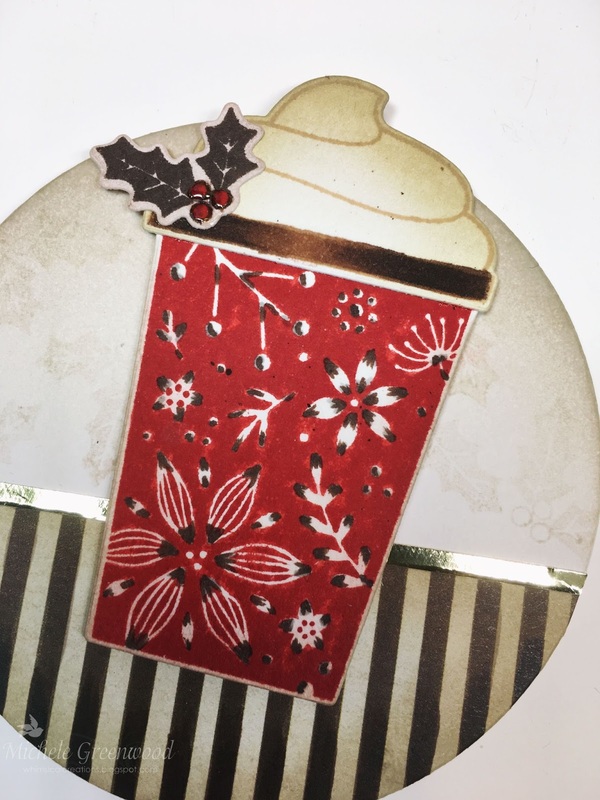 Love the coffee cup in the Christmas colours and it looks fab on the round card. This is lovely. Especially the cup in red.